If you recall, I had a part one post to this self created blog theme which I like to call ‘Sealed with a Kiss for XYZ.” The previous theme was Valentine’s Day. This is essentially where I bring you a theme and all of my favorite lip products that are associated with the holiday or event. Now I’m coming back to you with a fourth of July selection displaying my top five red lipcolor products. Let’s do this! Sephora Cream Lip Stain in the shade ‘Always Red’: This is one of my most recent obsessions and I have to admit I treat this lip product as if I can only wear it to a special occasion (gala, ball, evening soiree-you catch my draft.) Unfortunately I’m not that fancy so I end up wearing it to work or out while running errands. It applies as a gloss, but dries permanently on your lips…forever. Just kidding, it won’t stain forever but it definitely won’t budge until you use a make-up remover wipe or cleansing oil. I would recommend a cleansing oil so that you stress your skin less while removing make-up. 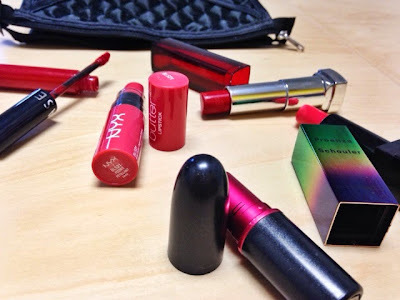 MAC’s Viva Glam lipstick: This is my favorite deep red lipstick. It’s just a gorgeous deep, deep shade and I am so in love with it. If someone raided my beauty drawers, I would pray to the beauty gods that they did not take this lipstick. Seriously! This is the shade of lipstick that draws that “wow” factor as you walk down a spiral staircase to see your date waiting patiently downstairs. I swear I’m not stuck in a fairytale. This is real-life. MAC’s Proenza S. ‘Mangrove’ lipstick: This is a beautiful orangish red lipstick (similiar to the famous ‘Lady Danger’ MAC shade that everyone raves about) but a bit more muted. I like this one a lot more than ‘Lady Danger’ because it’s not quite as orange and therefore, not as bright. I decided I would ease myself into the orangish red lipcolor theme rather than running full-force into it. Orange isn’t the most flattering shade on me so I wanted to play it safe. I’m quite obsessed about this color and product; so much so that I did a complete blog post dedicated to it last month! 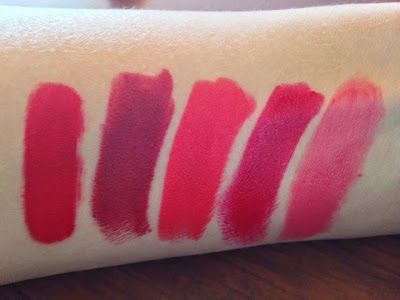 Maybelline’s ‘Very Cherry’ lipstick: Now Maybelline has always put out great lipsticks. They’re creamy, smooth, long-lasting, affordable and come in such great shades. 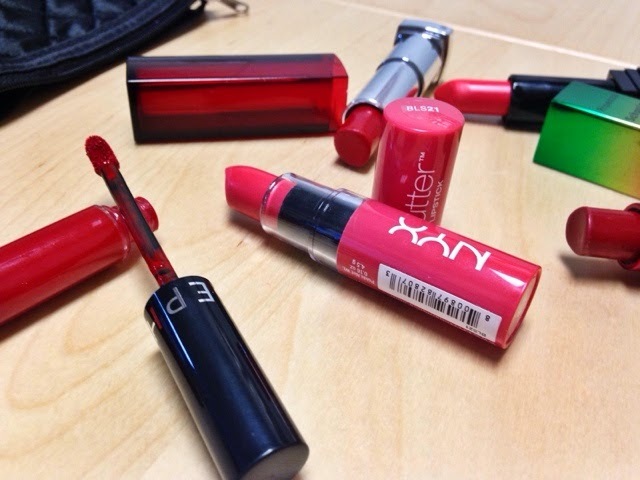 This is a bright cherry shade that really pops your lips pop. For the price, it’s really not beatable. This is just a shade and product you need to have in your beauty collection because it’s truly a staple. Go to CVS…I demand it! NYX Cosmetics Butter ‘Fizzies’ lipstick: This is a sheer lipstick that adds a pop of color in a muted sense. 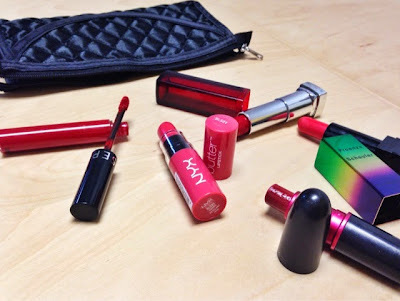 I would describe it as a medium coverage lipstick rather than full because it’s not a deep shade like ‘Viva Glam’ or a bright, vibrant full shade like ‘Mangrove.’ However, it does give a beautiful burst of red color that will bring attention to those lippies of yours. As you can see, these are all varying shades of red so no one can judge me for having so many reds! 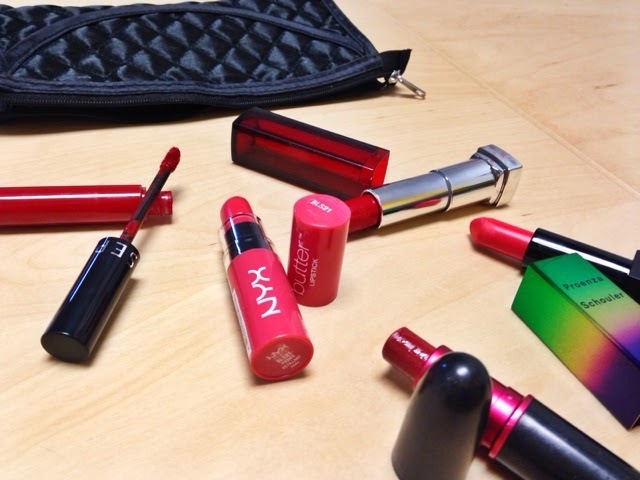 What shade of bold red will you be wearing this fourth of July?